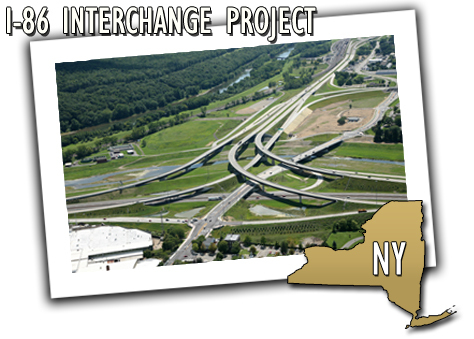 This project, led by NYDOT, incorporated major upgrades to a system junction (I-86/Future 1-99) that once was a diamond interchange between two state highways, Route 17 and Route 15. Nestled in the Three Rivers Valley near Corning NY, the project combined the challenges of developing a free-flow system interchange while balancing environmental, economic, and community issues. The project has significant importance to the local and regional community, but also needed to be viewed nationally and internationally as part of the trade corridor that connects Toronto and Detroit to the eastern seaboard. The project balanced the regional transportation needs with significant improvements to community cohesion and economic infrastructure, all performed on time and under budget. Numerous elements were included to enhance community involvement and safety, including the development of an animated video so that the public could view the actual “drive-through” of the interstate connecting ramps. In addition, NYDOT included a fixed, automated-spray, anti-icing system to reduce accident potential on the four new interstate connecting ramps over the Cohocton River levee system. This project required one of the most complicated levels of highway and bridge design along with traffic forecasting and transportation planning for an interstate highway system and interchange, as well as a full environmental impact study.